The long glass houses and other buildings of the nurseries known as The Vineries occupied a plot stretching back from from Belvoir Road, which is seen crossing the field of view diagonally in the bottom right hand corner of the picture. The site is now occupied by the houses of Howitt’s Close. The lane running back from Belvoir Road is Belvoir Avenue, still unadopted to this day. On the corner with Belvoir Road are the cottages and old mill building of the wind and steam mill that stood at this spot. Other houses with fronts onto Belvoir Road are Edwardian villas, and a set of Victorian workers cottages are seen alongside Belvoir Avenue. 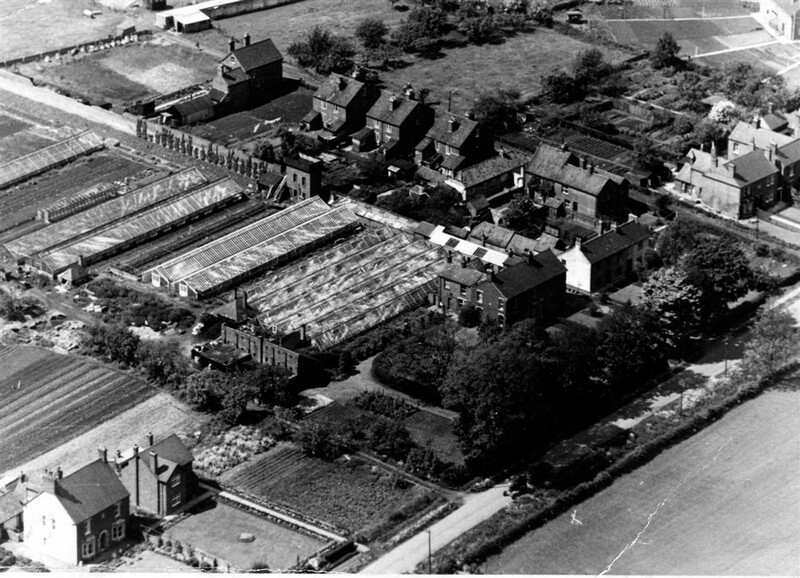 The date of this picture may be around 1950, because the radiating boundaries of gardens belonging to council houses on newly built Keel Crescent can be seen.